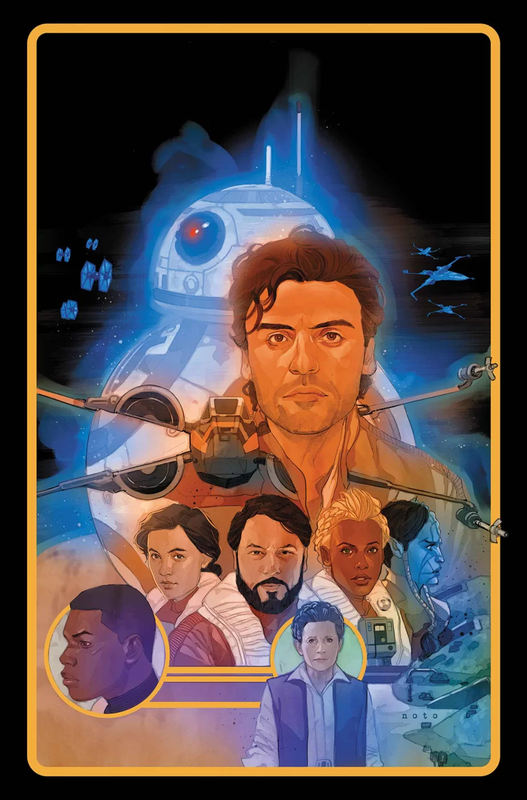 Poe Dameron #26 changes things up with a post-The Last Jedi story that features flashbacks to The Force Awakens. In particular, this issues sets out to fill in some of the gaps with Poe’s story in the movie. This includes the TIE crash on Jakku and his escape. However, the story Charles Soule chooses to tell contradicts Alan Dean Foster’s novelization of The Force Awakens. It’s just one more reminder that there are no canon police, and all Star Wars canon is in a constant state of flux. When new stories are told, anything can be re-written. The issue opens on the Falcon after the Battle of Crait. Poe, Rey and Finn are all sitting around the dejarik table talking. Poe tells them the story of what happened to him on Jakku after the TIE fighter crash in order to pass the time. This leads to a flashback of Leia giving Poe the mission to go seek out Lor San Tekka who now has the map to Luke Skywalker. There’s a nice line about, “The Empire ended on Jakku. Now, the end of the First Order will come from the same place.” The story explains why Leia sent only Poe and not more people (the better to stay under the First Order’s radar), and then Poe recounts the TIE fighter crash. Here’s where the events told by Soule differ from Foster. According to Soule, Poe triggered Finn’s ejection seat. According to Foster’s novelization, page 61, Finn found the ejection control himself and easily figured out how to use it. Also, according to Foster, Poe was unconscious at the time. Now skipping way ahead in the novelization, to page 140, Foster continues the story of what happened to Poe following the crash. This was a big deal as there weren’t many extra scenes included in the novelization, but this was one of them. Both Soule and Foster coincide with Poe’s jacket getting snagged and preventing his easy escape from the TIE fighter, him setting the TIE down more or less intact and tumbling out into the sand. In both accounts, Poe is saved by a Blarina named Naka Iit. The dialog of the encounter differs between the two, though in both, Naka teases scavenging Poe, Poe tells him his story, and Naka doesn’t believe it but offers to help him anyway. Foster plays up on the idea that the Blarina are an exceptionally hospitable people. Comparing both accounts, Foster’s version is better as Naka’s dialog is a bit more fun and colorful. However, Foster has both of them traveling in silence, whereas Soule uses this as a opportunity to do a nod to one of Poe’s previous adventures. Regardless, in both accounts Naka takes Poe to Blowback Town, they get attacked by the Strus Clan on the way there, Poe pulls the slow down/lift off maneuver to kick up sand and lose them, and Naka’s friend Ohn Gos gets him off Jakku. Foster doesn’t go beyond that, but the comic does, saying that Poe made a quick stop to Niima outpost, dropped Gos off on Nar Shaddaa, then Poe went off to D’Qar. So here’s the thing…was this really a story worth telling again? Soule expanded on it a bit, changed some things, and left the issue off to where the story could be continued in the next issue. But what’s the point? Are we in for a bunch of flashback stories that are all tantalizing told from the post-TLJ Falcon? On its own, it’s a well drawn and well told story, an entertaining little side adventure. But it doesn’t really add anything of importance, nor is it completely original. So I’m a bit conflicted on why they decided to tell this particular story. As is, I give Poe Dameron #26 a three out of five metal bikinis. It’s not bad, but I’m not sure where it’s going or what’s it’s trying to do. People aren’t exactly clambering for more TFA stories, and if Marvel really wanted to give fans what they want, they’d have to do something bold like actually tell a story set after the events of The Last Jedi. Alas, that’s not what were getting. At least not yet.